Entrepreneurial burnout is something that can creep up on you without you realising it. Chris shares his own experience with it and discusses the quick steps to avoid it. One of the subjects I am most vocal about is entrepreneurial burnout. Why? Because I experienced it firsthand and want to save you from doing the same. By December of 2009 I was working like a mad man – 15-16 hour days, 7 days a week. Business was very good, but working so much was taking its toll on my health and impacting my family. I ended up in hospital from exhaustion, and knew something had to change. My wife and I took some time away, during which we decided I would become the virtual CEO of our business. By 2010 we had done it; now I have 3 day weekends every week, and work 6-7 hours a day Monday through Thursday. 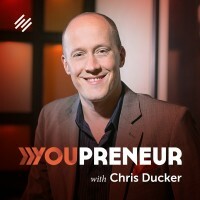 On today’s episode of Youpreneur FM I share my personal recommendations on avoiding burnout and setting yourself up for the long-game of entrepreneurship. Listen in and take notes so you never have to go through what I did. How to pace yourself with your business. Why minor wins will help you achieve major victories. How many people did I have to hire to replace myself in 2010? Why turning off your phone notifications is a small but important action. The necessity of a holiday: when and why you should plan your next one.